I like my soccer NANO-SIZED!! Some people prefer American soccer over Australian, but I prefer NANO-SIZED! The two boulder-shaped things are giant fullerenes, or large versions of buckyballs. While buckyballs consist of 60 carbon atoms, these GF’s can be made up of over a thousand. The lower boulder starts with 1300 atoms of carbon, and the higher one starts with 1100. The higher one doesn’t disappear, it just moves off screen. It seems that the giant buckyballs don’t actually roll, they slide. You are watching the GF’s lose carbon atoms and shrink in size. The actual buckyball, size C60, doesn’t appear until near the end of the video. Watch it twice and note the last frame where you can really see a circle with room inside it: right after that, you’re looking at a buckyball. It is about one billionth of a meter across! The process you’re watching is being called “shrink-wrapping,” because those GF’s, which are easier to create, are being shrunk down to the size of a buckyball. They’re heated up and begin to shrink via evaporation of carbon atoms. The actual buckyball appears at about 2000o C. The paper discusses in detail how they think the balls manage to shrink, but more importantly they think they’ll soon be able to stop the shrinkage whenever they want, creating fullerenes of specific sizes. The people who discovered the buckyballs won the Nobel Prize in 1996. It’s amazing what these Buckyballs might be able to do. They could swim safely through your veins or clean up toxic waste! Nanotubes of similar structure might be able to both conduct and insulate current, based on small changes in size. Warm greetings, fellow science enthusiasts! While the previous intern, Katie, romps about in the Alps, I, Calla, will be your Rocky Mountain blogger (does high altitude make for good science writers? The data suggests YES.). I’ll be signing in as Agent Utah, in reference to my home state, (though not in reference to Keanu Reeves’s character in what was possibly his most poignant film). I just graduated from UMass Amherst (WHOOP) in May with a double BS in physics and astrophysics, with a little writing on the side. For my first job, I have been blessed with the task of keeping you folks entertained and informed. Let me know how I’m doing, and what you’d like to see. You’ll probably see me zooming in on a lot of astronomy articles, ‘cause they’re my favorite, but I’ll be sure to grab anything else that I find weird, interesting, important, or funny. PS - If you don't get that Keanu Reeves reference, you'll have to IMDB it. Do you Know Enough Physics to Be a Diesel Engine Technician? This test is surprisingly tough. I disagree with the way that a few of the questions are phrased, but it's a fun test of your classical physics expertise. It's all about the Magnus force, baby! In the physics world, we like to say that you can do anything with a degree in physics. You can be a doctor, lawyer, stockbroker, musician, artist, engineer, teacher... you can even be the winning pitcher in the opening game of the National League Championship Series! That's right, we're going to bask in some of the glory of yet another fantastic post-season pitching effort by lefty Jeff Francis of the Colorado Rockies. Way to go Jeff! You could win the a trophy so small that you'll need to borrow an electron microscope just to see it! Don't worry, they're going to give the winner of the PhysicsCentral Nano Bowl a plaque with a micrograph of the trophy on it, just to show what you've won. On top of that, they're giving the winner $1000 in actual money that you can see with your naked eye. And to really top things off, I hear they're going to present the prize to the lucky winner in a solemn ceremony to be held in the nearest phone booth on Super Bowl Sunday. You're Grandma will be sooooo proud! Check out the rest of the rules. Tuesday next week is Physics Nobel Prize day, when the prize for physics will be announced. 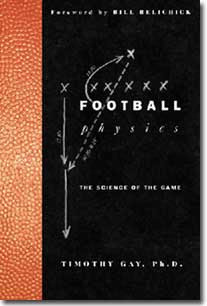 The prizes for other disciplines will be announced on the other days of the week, but I tend to focus only on the physics prize. My buddy Davide predicted the winner last year, and I was wrong as usual. Once again, my pick for the most deserving potential Nobelist is Vera Rubin for discovering that most of the universe is made of mysterious dark matter. But lots of folks tell me that the Nobel committee won't pick astrophysicists two years in a row, so my second choice is the research into slow light and the induced transparency that makes it possible. I think that would mean Lena Hau of Harvard would share in the prize for slowing and stopping light, and Steve Harris of Stanford would get a portion for both discovering how to induce transparency and working with Hau to slow light. In addition, many of Hau's and Harris' colleagues deserve a cut as well, but the committee will probably only pick one other person. Who that will be, I can't foresee. Of course, there are many other possible candidates, so the odds are that I'm wrong. But it's no fun unless you take a guess. Is it possible to snowboard to safety in front of an avalanche? Popular Science magazine says no, but I say yes. Check out my latest post on Extreme Sports Physics to see who you believe. I wouldn't suggest that anyone try it. 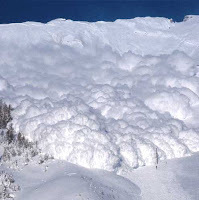 In fact, after watching a few videos of people swallowed up by avalanches, I would recommend that everyone stick to the trails and slopes in parks that have been cleared of all avalanche hazards. Death by avalanche seems an unpleasant way to go, to say the least. I couldn't bring myself to include any of the YouTube clips of people being caught in avalanches (as an avid snowboarder, they give me the creeps), but here's a pretty cool video of a few avalanches being triggered by helicopter.